In this week's new releases, breakout hit Yuri On Ice hits disc in the UK, alongside more Dragon Ball Super and more Yu-Gi-Oh than you shake a card at. Stateside, Sony Pictures Animation's smash-hit Hotel Transylvania 3 comes to home entertainment, alongside another crop of anime titles. Dragon Ball Super Part 5 (Manga, PG) Goku battles Goku Black. Read our review. Drifters Season One (Universal, 15) Historical figures battle in the afterlife. Fate Stay Night: Unlimited Blade Works Part 2 (MVM, 15) The Grail Wars continue. Yu-Gi-Oh! Movie Triple Pack (Manga, PG) Collecting the three Yu-Gi-Oh features. Yu-Gi-Oh! The Movie (Manga, PG) Digitally remastered edition of the first movie spin-off of the card battling anime. 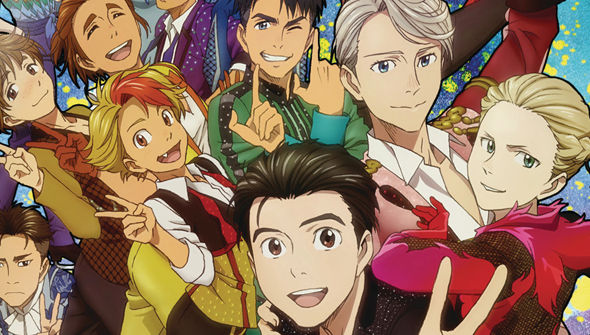 Yuri On Ice: Complete Series (Sony/Funimation, 12) Ice skating romance. Read our review here. Monster Hunter Stories; Ride On- Season One Part 4 (Funimation) Video game based anime. Nanbaka: Part 2 (Funimation) Prison set anime comedy. Prison School: The Complete Series* (Funimation ) Outrageous anime series. Recovery of an MMO Junkie: Complete Series (Funimation) Anime about romance and friendship in a virtual world. World Break: Aria of Curse for a Holy Swordsman - Complete Series* (Funimation) Action anime. Zillion: The Complete Series (Funimation) Classic sci-fi anime.